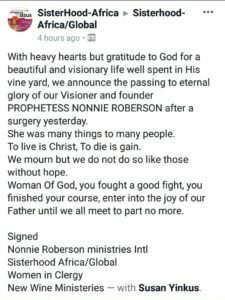 Pastor of Nonnie Roberson Ministries (NRM) and Founder of Sisterhood Africa/Global group, Prophetess Nonnie Roberson has on Wednesday died after complaining of abdominal pains. Giantability’s Damilola gather that the group announced her demise in a post shared few hours from the time of this report, it read, “With heavy hearts but gratitude to God for a beautiful and visionary life well spent in His vine yard, we announce the passing to eternal glory of our Visioner and founder Prophetess Nonnie Roberson after a surgery yesterday. “She was many things to many people. To live is Christ, To die is gain. We mourn but we do not do so like those without hope. “Woman Of God, you fought a good fight, you finished your course, enter into the joy of our Father until we all meet to part no more.” The announcement read. In a related post Eden Onwuka wrote on the group, “The official announcement of the unexpected transition back to glory of the mentor and visionary of this group (after a medically necessary surgery) has been announced. It is not a hack, not a joke or ruse unfortunately. “We are all grieving, but we refuse to be hopeless. More than ever before, this is a strong reason to continue the legacy of faith and pursue assignments with focus. “To set out face as a flint and be all God has called us to be. To strive to live such a life of impact that when we die, the world feels our absence just like we all feel hers. “Let me kindly ask though that in our grief, we try to show some respect for her immediate family’s feelings and privacy. And show some sensitivity for those who will be handling the unfolding aspects of events in the coming days. “May the spirit of God release his grace and comfort through every heart like only him can.” The post read. The Popular Nigerian pastor is said to have died in Nizamiye Hospital few days after she had complained of abdominal pains. The deceased who passed on in the early hours of today was a successful entrepreneur, she understood how to balance the market place, her ministry and her mandate to reach out to the poor, outcast and downtrodden in society. Nonnie while alive saw the need to reach out to the un-churched after pastoring a local assembly for 10 years, this she did through her outreach programs to prisons, hospitals, prostitutes, drug addicts, widows and orphans. This entry was posted in Christianity, News and tagged Eden Onwuka, Nizamiye Hospital, Nonnie Roberson Ministries (NRM), Sisterhood Africa/Global. Bookmark the permalink.